I had previously met folks from South Carolina, western North Carolina, and Georgia at local singings, but at this first all-day singing there were many unfamiliar faces. I remember meeting such luminaries as Hugh McGraw and Harry Eskew, but one particular introduction stands out in my memory: a very sweet woman who was unable to speak scrawling out notes on a pad to let me know how excited she was that I had started singing Sacred Harp, and how much she hoped that I would keep coming back. This woman also wrote that she was eager to have a copy of the audio recording that I was making of the singing. I was lucky enough to get to sing with her many more times over the next several years. 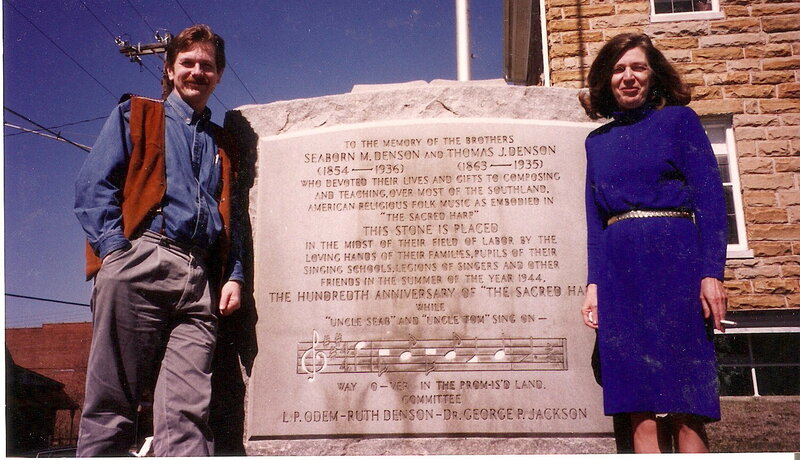 Warren Steel and Amanda Denson at the monument to the Densons at the Winston County Courthouse in Double Springs, Alabama in 1994. Photograph courtesy of Warren Steel. In the second session that morning this woman, Amanda Denson, led 78b (“New Britain” in The Christian Harmony) and “You Are My Sunshine” with her granddaughter, Emily. I distinctly remember Amanda handing Hugh a note requesting “You Are My Sunshine” because it was Emily’s favorite song, and it was just one week until her birthday. At not-quite four years old, Emily was shy about being in the square, but Amanda was so happy when everyone began singing that she clapped her hands, smiled, and cried from sheer joy. I learned later just how much this moment meant to her as I realized that the only thing that Amanda took as much pride in as Sacred Harp was her family. Nothing could surpass those moments when she was able to bring the two together. Even though “You Are My Sunshine” is hardly an appropriate choice for a Sacred Harp singing—which no one knew better than Amanda, the granddaughter of singing master and composer uncle Tom Denson—we were happy to bend the rules if it would ensure that little Emily got to have the best possible experience in the hollow square. [Read about Tom Denson’s last lesson and letters of condolence sent after his death in our December 2013 issue.—Ed.] As I think back, I realize that this is the reason that Amanda wanted a copy of my recording—so she could relive the beauty of that simple moment. Amanda was always sweet and encouraging to new singers. Even throughout her illness she was appreciative, gracious, and full of cheer. It is hard to believe that seven years have passed since she left us. May we always remember her unbounded joy.